● Member of the Society of Chiropodists & Podiatrists. ● IRMER certificate for taking X-rays for the Foot and Ankle. Gemma embarked on a degree at the University of Brighton where she passed with a 2.1 hons in Podiatry. Since graduating, she has worked in numerous clinics specialising in different areas, giving her a wide understanding of the subject. 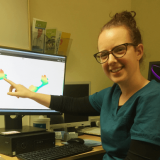 Her roles included Podiatrist for the NHS specialising in routine care and management, Biomechanist (science of human movement) for Sure Clinic, and Podiatrist at The Gait and Posture Centre in Harley Street where she focused on gait analysis and orthotic prescription. Gemma is an extremely competent chiropodist and can successfully remove corns and calluses to make your feet comfortable. She treats fungal nails and Verrucae using the Fontana medical laser and uses cryotherapy to treat small verrucae. She also has experience in human gait analysis using pressure plate studies and slow motion analysis to treat postural pains and flat feet. In her spare time, Gemma is a keen dancer and also belongs to an amateur dramatics society. She also has a BA in Philosophy.